Some of my happiest days have been spent at my local library. I loved going there when I was younger, and I'd lose my mind every time they ordered in new books. To me, there was nothing better than a shelf of new and glorious tomes that I could explore at my leisure. Fifteen books was the limit, so every week I'd take out as many as I could and a week or two later I'd bring them back, read and enjoyed. It got to a point where I'd pretty much exhausted the children's and YA section and I ended up re-reading a lot of their stock. I was basically Matilda. Back then, all of the librarians knew my name. Some of them even watched me grow up from a baby, to a happy eight-year-old, to a thirteen-year-old who thought she was cool, and no matter what happened I always participated in the annual reading challenge. I got older and my tastes changed but the reading challenge was a constant. To some people this might seem geeky, but in a library, no one cares. That's one of the amazing things about it - everyone is the same. Admittedly, I no longer use my library. I'm privileged in that I get so many review books sent to me that I don't really need to use it, although I have been thinking about renewing my membership. 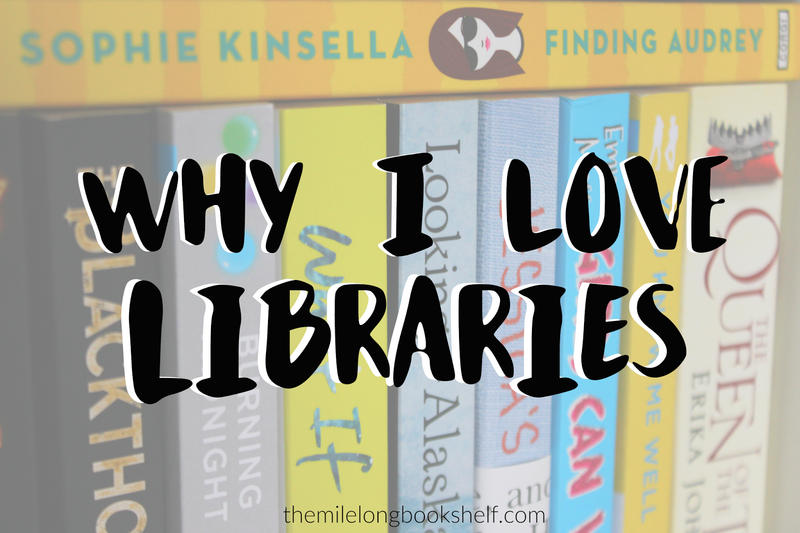 It's not just local libraries that are great, either. I loved the little library we had in primary school, and I still remember some of the books I devoured through it, most of them being pink, sparkly and about ponies. Those were the days. @MileLongBookS libraries gave me access to books when we couldn't afford to buy a lot of them. @MileLongBookS When I was ten, I walked my dog to the village library. It was so small, they let her in with me, and we browsed together. I especially love that last one! It's amazing how much of an impact libraries have on people's lives, and yet they're still being closed all over the nation. It's sad, because if I hadn't had access to a library when I was younger, I'm not sure I'd be book blogging today. I remember getting a new library card and proudly signing my name on the back to confirm my ownership. I remember trudging home across town, having to peer over the stack of hardbacks in my arms because I'd forgotten to bring a bag. I remember a year or so later when me and a (better) friend went to the library after school so she could help with my MyMaths homework (who remembers that?) and I could help her with English. Loads of people we knew from our school from all different cliques were in there, because libraries bring people together whether they notice it or not. A librarian came in with a box full of brownies that she'd baked in preparation for GBBO and gave some to every person in the library, whether she knew us or not. It was nice. But my favourite thing of all? In a world where we're bombarded with advertisements 24/7, a library is the only place that isn't trying to sell you anything. A library is the only place you can go where you will be accepted. A library is the only place where you can access internet, books, DVDs, games, shelter and community for free. Where I live, we don't have a bookshop, but we do have a library. If the library closes, my town won't have any connection to literature at all, and thousands of children will miss out on the experience I and so many others have had. So many potential bookworms, lost. Books are expensive when you can barely afford to feed yourself. I might not be using it at the moment, but I love my local library. That was a great post, Amber. And right on! Many times we forget that we are privileged that we have such bountiful public libraries with computers, Internet, and some of the latest books. I don't know if this is really a thing, but would you mind if I wrote a response post? I was writing my little comment, and I realized it was more of a really big comment. Anyway, I'd love to share my own library- life story, but I just get a little nervous taking ideas from people without asking, even if it's a response. Lovely post! This one really touched me. I love this post Amber, and it makes me sad libraries are closing left, right & centre. Our local library is still here and I've been a member since July and I just LOVE IT. I can request books before their release date so I know I can read them shortly after, and there's nothing I like more than the text message to tell me a book is ready for me, or to just go in and look at the shelves, it's amazing. What does make me sad is that I rarely see people in the library. People use the computers, but there aren't many people browsing the shelves, at least when I'm in, and that makes me worry it will get closed because it's just not busy enough? That would genuinely make me sad. Like you say, not everyone can afford to buy new books, or even have the internet so they can find a job, or just get a bit of warmth. Me too - I wouldn't have been able to read much at all! I adore my library system - they go above and beyond to make books and learning accessible to everyone. About 15 years ago my city built a larger library, so I feel lucky. The new building was built to also incorporate communiuty functions. There is an auditorium, conference rooms, an art exhibition hall, a local history/geneology mezzanine, a computer lab, a "maker" room for crafters, a gift shop, a snack room with vending machines, and a reading garden. I think they realized that in order to keep the library relevant it needed to be about more than just books. They have the usual book clubs, but also a weekly adult coloring night, a knitters group, a group that reads plays aloud, a lego building group, anime drawing group, and a local history group. They also bring in free shows for children like magicians, and live animal education programs. I really see this as the future of libraries. Some libraries in the state of Pennsylvania have musical instruments you can borrow! Great post. I hope there can be a way to figure out how to keep your remaining libraries solvent. WOW. That sounds like the best library ever! I've never seen one with so much going on - I wish my local one was like that! Hi, I was just wondering- what blog template did you use? I would love something similar for my blog. And me now loves it too. I'm volunteering to help run the Summer Reading Challenge this year - I start tomorrow! Hurrah! - because I'm too old to participate now, but I decided to do it at a smaller library than my local massive one because they needed the help more - and it's the kind of village library we really need to keep open.